Velixo is a unique Excel-based financial reporting tool built for Acumatica and for the cloud. It offers Acumatica users a financial management solution that will make life much easier. The Acumatica ecosystem is expanding rapidly, providing Acumatica users with a diverse collection of third-party software solutions that allow them to tailor Acumatica cloud ERP for their specific needs. In this article, I had the opportunity to speak with Gabriel Michaud who saw a need that spanned every industry and developed a solution to meet it: an Excel-based financial reporting tool called Velixo. Those familiar with Acumatica’s history may recognize Gabriel Michaud’s name. In 2009, he was the first Canadian VAR in the Acumatica ecosystem. He and his partner implemented Acumatica’s cloud ERP software for companies in Canada, the U.S., and France until Gabriel decided to sell his shares and join the Acumatica product management team. After four years with Acumatica, he left to develop an idea that began 15 years earlier. Fast forward to 2017 and Gabriel didn’t see anything similar in the Acumatica space. He decided to create a solution on his own, leveraging Acumatica’s capabilities to do so. Though his solution is unique for many reasons, he acknowledges there are other ISVs with Excel-based tools, but he says their approach is different. My focus [with Velixo] is narrower. It doesn’t replace what you have inside Acumatica,” he says. He’s referring to Acumatica’s Analytical Report Management, or ARM, which is a web-based tool for creating and modifying analytical reports. With advanced data selection criteria, data calculation rules, and customizable report layout design features, users can design specific analytical reports for their organization. With Velixo, Acumatica users have a “very, very convenient way to work from Excel and build their own financial reports.” He notes that his financial management software provides both financial reporting and project reporting. As with Acumatica ARM, Velixo allows you to create progress reports, calculate costs, compare actual costs vs. budget, and more. But why did Gabriel choose to design and market Velixo as an Acumatica-only solution? “It allows us to have the best possible integration and to support features that we would not be able to support otherwise,” he says. To explain the security aspect more fully, Gabriel points to Velixo’s very first customer, KFC France. The company—which is owned by a large, publicly-traded European organization that also owns Burger King and Starbuck franchises throughout Western Europe—outsourced their accounting and bookkeeping operations to an accounting firm in Paris. In addition to entering invoices, paying vendors, doing bank reconciliations, and more for approximately 60 KFC France locations, the firm also creates a full financial report every month with dozens of tabs and thousands of cells and calculations, which they would have done manually if not for Velixo. “They decided to expand the use of the tool and give a copy to every restaurant and area manager across France. Now, all managers are able to open Excel and run the report, but the key thing is that they only get to view the numbers and results for the specific locations they manage,” he says. Why should Acumatica customers choose Velixo? Building Velixo for Acumatica cloud ERP exclusively means the financial management software works exactly as designed, unlike a product that is built to work with every ERP available (thus not working well with any of them). Also, many of these products were produced before cloud ERPs existed, making them inefficient or even unusable. Velixo was designed with Acumatica and the cloud in mind. Velixo’s features align with what ARM provides, offering users the flexibility, ease-of-use, and simplicity required for more complex financial reporting and project reporting through Excel. Velixo, as with all Acumatica ISVs, offers a solution that allows users to extend the capabilities of Acumatica cloud ERP. But, unlike other Acumatica ISVs, Gabriel says Velixo is not for any specific industry, nor, for that matter, very narrow business requirements. Instead, Velixo is a cross-industry financial management and reporting solution. “It’s something everybody should want and have for their business,” he says. If you have questions about Velixo’s Excel-based, exclusive Acumatica financial reporting tool, contact Velixo or review Velixo in our Extension Catalog today. 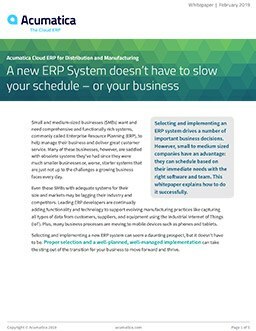 And for more information about Acumatica’s cloud ERP software and ERP platform, contact our team at any time. Product-centric companies interested in cloud ERP need this expanded Gartner Market Guide.